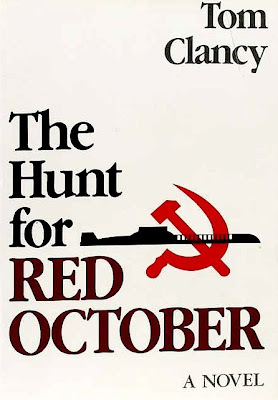 Bookride: Tom Clancy, The Hunt for Red October, 1984. Tom Clancy gave birth to the techno - thriller with this book - his first novel. It is said to have been written with the assistance of current copies of 'Jane's Fighting Ships.' His hero Jack Ryan assists in the defection of a respected Soviet naval captain, along with the most advanced ballistic missile submarine of the Soviet fleet. The movie (1990) stars Alec Baldwin as Ryan and Sean Connery as Captain Ramius. After the success of the movie people started to look out for this book and a whole mystique grew up about how to identify a true first edition. Basically you need 6 blurbs on the back in this order from top to bottom - Jack Higgins, Joseph Wambaugh, Clive Cussler, Edward L. Beach, John Moore, and Stansfield Turner. There should be no statement of edition with no series of numbers, no price on d/j, Clive Cussler review on rear jacket cover must be third one down, ISBN on lower back panel & on lower back of jacket panel. The 'no price' thing is a catch as no price usually indicates a reprint or, worse, a dreaded BOMC. Watch out for remainder marks along the bottom. There is even someone claiming the book must weigh 1 pound 13 ounces*; one wily vendor claims that bright fresh copies are hard to find because 'most of the small run of 1st printing copies were sold to submariners and have damp stains.' Doubtless it is hard to keep books and their jackets from harm in cramped quarters several fathoms down. It was the first work of fiction published by Naval Institute Press and their most successful book ever; reportedly it was published in an initial print run of some 5000 copies. '...the dedication page of this Behemoth carries a lapidary, capitalized inscription, 'To Ronald Wilson Reagan, Fortieth President of the United States: The Man Who Won The War.' And this is only fair. In 1984, the Naval Institute Press paid Tom Clancy an advance of $5,000 for The Hunt for Red October. It was the first fiction that the Naval Institute had knowingly or admittedly published. There matters might have rested, except that someone handed a copy to the Fortieth President, who (then at the zenith of his great parabola) gave it an unoriginal but unequivocal blurb. 'The perfect yarn,' he said, and the Baltimore insurance agent was on his way to blockbuster authorship. Putnam this past August issued a first printing of 2,211,101 copies of his newest novel, Executive Orders, and, on the Internet site devoted to Clancy, mayhem broke out as enthusiasts posted news of pre-publication copies available at Wal-Mart. Clancy's nine thrillers, as well as exemplifying an almost Reaganesque dream of American success, have catapulted him into that section of the cultural supermarket which is always designated by the hieroglyph #1. These are of negigible value as is almost everything else by Clancy, except the limited 'The Sum of All Fears' (1991, 600 signed copies) which can be had for a $100 bill. There are shelves of signed Clancy's at completely unattainable prices many with a much admired dealer named "FlatSigned" and the cutely named 'Books Tell You Why". VALUE? There are an awful lot for sale and the film is the kind of thing you see on sale for $1 as a Video in thrift shops now. The high tech gadgets now look laughably obsolete with computers running Wordstar with files on separate floppies and programs whirring away on enormous Cray-2 "supercomputers". The wave has broken on the book, a decentish proper first failed to get a bid at $299.99 at ebay last week - recent terrestrial auction records show a marked lack of interest in the book with copies going through at between $300 and $700. Curiously the highest prices are reserved for proof copies. These do not normally work anymore but in Clancy's case there may be punters for them, if you collect the book a fine/fine signed first is fairly easily acquired at the $1000 level and less, so a proof is the next step. One guy wants $4000 for unsigned 'revised and uncorrected proofs, another $3800 for a "SIGNED, unrevised and unpublished proof. Very good, in the original proof dust jacket with banner reading "Coming this fall! A thrilling novel of undersea suspense from America's leading naval publisher." Outlook? It will always be a major classic of adventure and may be looked on in a hundred years time as we look on '20,00 Leagues Under the Sea' - in the meantime, although it hasn't sunk it is not rising at all. * Some sellers insist 2 pounds is the right weight. Any credence to the 6 blurb back jacket as the first printing? I think I have an original but it has 8 blurbs and Clive Cussler is the 6th down, but he is third up on the back of the jacket. E-mail me at jcooper0331@yahoo.com if you have more information, thank you. I thought I had figured out that my copy was 1st edition, 2nd printing, but now I'm not so sure. Like "Anonymous" above, my copy has 8 jacket reviews with Clive Cussler six down. 1. NO Library of Congress publication information. There is a blank space between "All rights reserved..." and "Printed in USA." 2. There is NO printing/edition information, and no price on the back. Neither is there the Hammer and Sickle on the hardcover of the book. Is it some sort of library binding? (No library markings, but I may have got it at a library sale). Any ideas about what printing/edition this might be? It definitely looks like a first edition, but I don't know what sort. Any ideas, email moses.contra.mundum@gmail.com. Thanks! Tom Clancy sent me a signed first edition, specifically to me, "Brian Keith, subdriver" when I was on the USS Dallas. He used to talk and chat with my aunt, manager of store, huge reader, in the bookstore in Upper Malboro, Md., Crown bookstore, before he published the book and she told him she had a nephew on the Dallas, so that is the sub he used. I never asked for the book. Does this change the value much. It is the very first printing. I have a 1984 Book Club Edition. It is 81/2” in height in very good condition. The jacket has not fared so well with a tear at the bottom and top on the front. The book has the hammer and sickle on the front with silver lettering on the side. The red cover also has a maroon tape cover over the red cover that the silver lettering is printed on, it extends 11/4” from the edge. It has only 12 lines and no ISBN number. It states it is a Book Club Edition at the bottom of the cover on the inside. At the bottom of the cover on the back there is a number 05623. I do not expect the book will be of much value being a book club edition but the book is in excellent condition. I bought it in a thrift store for a couple of dollars.